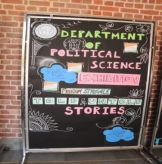 Department of Political Science offers an undergraduate three years Honours course and Generic Electives to other Honours courses as well as courses at the integrated B.A. Programme level. It was established in 1972. 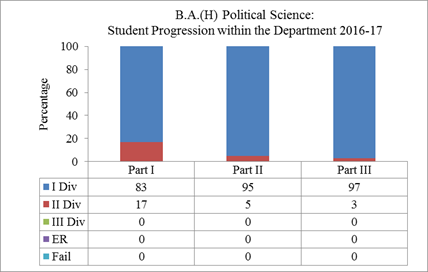 The department has a diverse faculty whose specialization spreads across various fields of Political Science and caters to the largest number of students across disciplines. The core emphasis of the department is on familiarising students with the conceptual and applied essence of the discipline. The course offers a set of skills which are an excellent preparation for public policy making, policy analysis, legal fields, international relations, diplomacy, political consultancy, public affairs, academics and research. The department has established several collaborations with both national and international organizations in order to provide hands-on experience to students. The department prepares students for a wide range of careers, who join government, non-government organizations and private sectors. A large number of students opt for higher studies in prestigious institutions in India and abroad. The discipline of Political Science requires students to understand politics in all its nuances, to probe power relationships which exist in human interaction and examine the fundamental principles of democratic functioning that guide ideas and institutions. Members of faculty use innovative teaching methods to make learning experiential. This involves the use of debates, discussions, movie-screenings, quiz and drama. Series of public lectures and workshops designed around the course are also used by teachers to provide extensive knowledge to the students. Project presentations on contemporary political themes involving original thinking and relevant research are an integral part of learning. Value addition to the courses is also done through workshops, invited talks, seminars and conferences. Street plays are used as a method to discuss important political issues. Field visits and study trips aid to the teaching learning process. 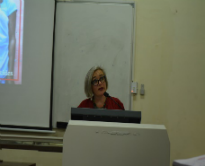 The department recognises the need for making project work as an academic requirement for all courses. Students undertake projects on all papers under the supervision of the concerned faculty. This practice of the department has been lauded over the past three decades. These projects are undertaken in various formats including group work as well as individual presentations. These entail field work, case studies, literature review, data collection and presentation with emphasis on interpretations. Through involvement with the prestigious Delhi University Innovation projects, students build their research and writing skills in close interaction and guidance by faculty members . The department is home to 'Tula', the consumer awareness club of the college. It trains and orients students to be responsible consumer through interactive talks and annual workshops. 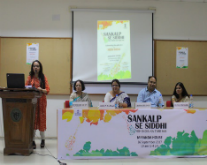 Knowledge of the Constitutional provisions and laws are also provided to the students through workshops in association with organizations such as Delhi Legal Services Authority. Academic essay writing and rapporteuring are encouraged in a sustained manner. The department produces two annual magazines, viz. the Vox Populi and the Santulan. It also encourages its students to be involved with both government and nongovernment organisations through internship programmes and exposure visits. 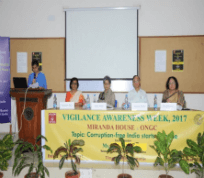 The organisations associated with the department include, the National Legal Services Authority, DLSA, Ministry of Consumer Affairs, Niti Aayog, CFAR, WFS, FES, RGICS and others. 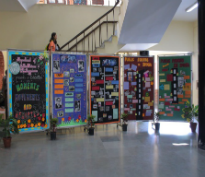 The students of the department are also guided by the department to be associated with the larger vibrant co-curricular and extra - curricular life of the college by participating in its Women's Development Cell, NSS, Enactus and Debating Society as well as being on the editorial board of the college magazine. Dr. Jayashree Pillai has been awarded a research grant from UGC to conduct a national level seminar and as well as a research project. Dr. Jayashree Pillai and Ms. Sonali Chitalkar have been granted a major research project from ICSSR. Dr. Purnima Roy was bestowed the Distinguished Teacher's award in 2009. Innovative DU Research Programmes have been granted to Dr. Purnima Roy, Ms. K.K Subha and Ms. Pushpa Singh. Bijayalaxmi Nanda was awarded the Teacher's Excellence Award by University of Delhi in 2017. She has received consultancy grants from WHO, UNFPA, PFI and NFI. Dr. Namrata Singh has been granted a research project on disaster management. Dr. Skylab Sahu and Dr Rashmi Gopi have been provided research grants to organise national level seminars by ICSSR. Department faculty members have also been on National Committees and International Committees. Dr. Jayashree Pillai has been Faculty Consultant, National Consumer Help Line Phase II, Ministry of Consumer Affairs, Government of India in 2010-2011 & Life Member of Indian Institute of Public Administration (IIPA) Government of India. Dr Bijayalaxmi Nanda has been on the Advisory Board, Pre-Conception and Pre-Natal Diagnostic Techniques (PCPNDT) Act, Government of Delhi in 2015-16 & State Supervisory Board, Pre-Natal Diagnostic Techniques (PCPNDT) Act, Government of Delhi in 2013-15. 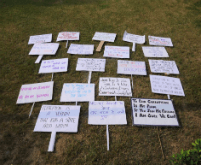 Hena Singh has submitted her Ph.D. on 'The Quest for Gender Equality & Gender Justice in India: Interrogating the Role of the State-from Independence to the Era of Neoliberal Reform' at the University of Birmingham, United Kingdom. Our alumnae are distinguished women contributing in their own special ways to social and political development both nationally and globally. They have distinguished themselves in the fields of academia, research, civil service, social service and international conflict resolution. Sugandha Munshi is a Gender Specialist who has worked extensively with marginal communities in Bihar. She was awarded with the 'International Rice Research Institute National Women Achiever Award 2014' and also with the 'Mahila Krishak Award'. Sushmita Dev is one of the youngest Members of Parliament in India. She heads an NGO named 'Aashiyan' in Silchar. Shahla Nigar, who topped the civil service examination, is presently Secretary (Finance), Government of Chattisgarh. Chamithri Rambukwella is in the United Nations General Assembly and has been elected, the Second Secretary of the Permanent Mission of Sri Lanka to the United Nations in New York, and as Vice-Chair of the Fifth Committee. 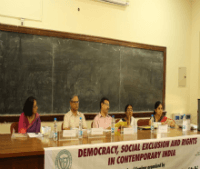 Nupur Roy, Anoushka Singh, Tahira Khatun, Upasana Mohanta, Anuradha Singh are Assistant Professors in central and state universities. Shakti Mohan and Bandana Rawat have contributed in the field of creative arts. Savita Sinha and Vernika Tomar have excelled in the legal field.